Stage3 is an online fashion wear rental shop that has its outlet in Delhi but delivers all over the country, including Pune. Stage Three offers you a wide variety of clothing options to choose from. Bandhgalas, sherwanis, suits and tuxedos. Check out the collection here. You can rent for 6 days at not more than INR 3000/- which otherwise would have burnt a hole in your pocket. For women, they have a gala variety of lehenga, saree, dress, anarkali, gowns and more by ace designers such Anamika Khanna, Sabyasachi Mukherjee, Rohit Bal, Manish Malhotra, Tarun Tahiliani and more. For more details, click here. The rent for three to six days doesn’t cost more than INR 3000. They have different looks on the website for you to choose from. Some are as cheap as INR 900. Just follow the three basic steps, select, rent and return. Ready for a portfolio shoot but do not have clothes? Invited to a high profile wedding and you have no clue what to wear? Stage Three should be your one-stop solution to all these problems. 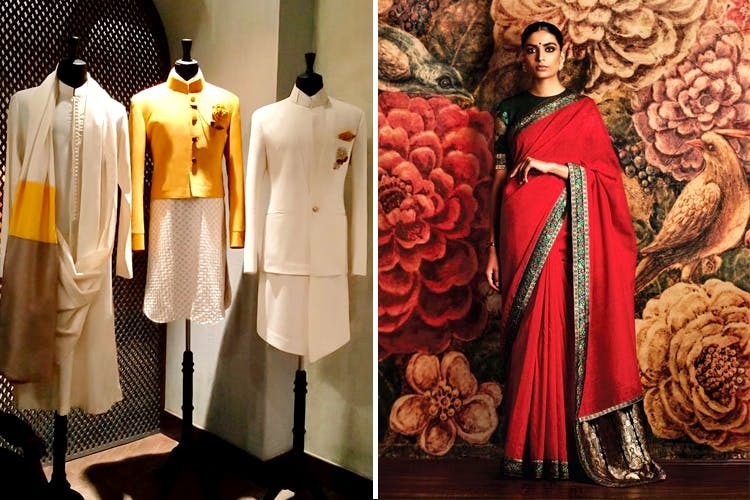 Want A Sabyasachi Lehenga For Your Best Friend's Wedding? Rent It Here!